Get 15% off your ENTIRE ORDER at LordVaperPens.com using code: MDC15 at checkout. 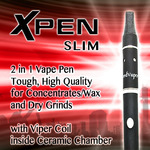 Lord Vaper Pens is home of the original X Pen series Slim and non-combustion favorite the X Pen Pro and The Chief series by Chuck Billy of heavy metal legends, Testament. We put quality and much thought into our products so you sit there and go wow this is badass! Go to Lord Vaper Pens for more information.